Dutch Apple Pie is my all time favorite pie. 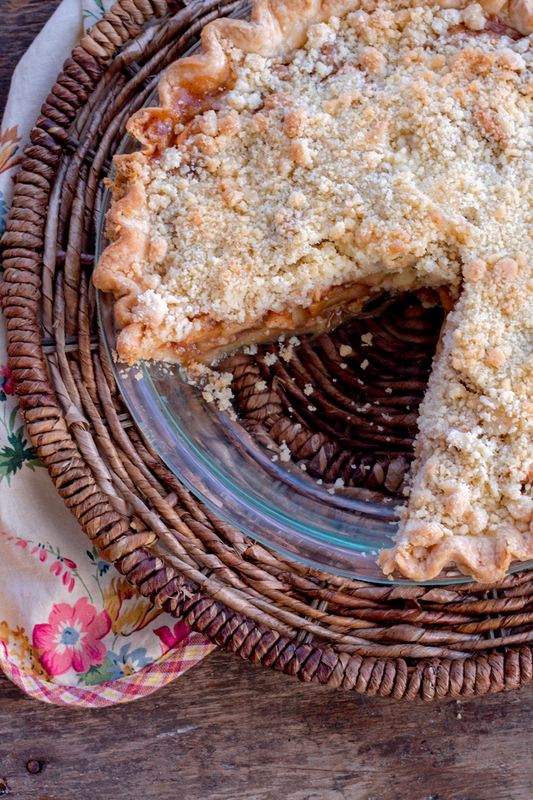 Homemade crust, apples , cinnamon and the crumb topping…I love the crumb topping. Good grief you have to love the genius of the first person to ever decide to take fruit, put it in a pastry crust and create pie. There have been lots of adaptions along the way. This recipe for Delicious Dutch Apple Pie is absolutely wonderful. The filling in the pie sets up nicely, if there’s one thing that drives me batty its when the filling spills out and onto the pie plate. This set up perfectly , even though I cut it when it was slightly warm. You can save yourself some time and use a pre made pie crust. I made homemade and will include that recipe after the pie filling recipe just in case you want to try it. It always turns out so flaky and delicious and can be made a day ahead and stored in the fridge. I’ve said this before and I’m saying it again. Lemon does wonderful things to apples, it brightens their flavor just like it does for berries. Please don’t skip tossing the apples with lemon juice. My husband stood in the kitchen waving the pie in the air trying to make it cool faster so he could have a slice. And when he finally got a slice, it was followed by another. You’re going to love this Delicious Dutch Apple Pie! Enjoy! 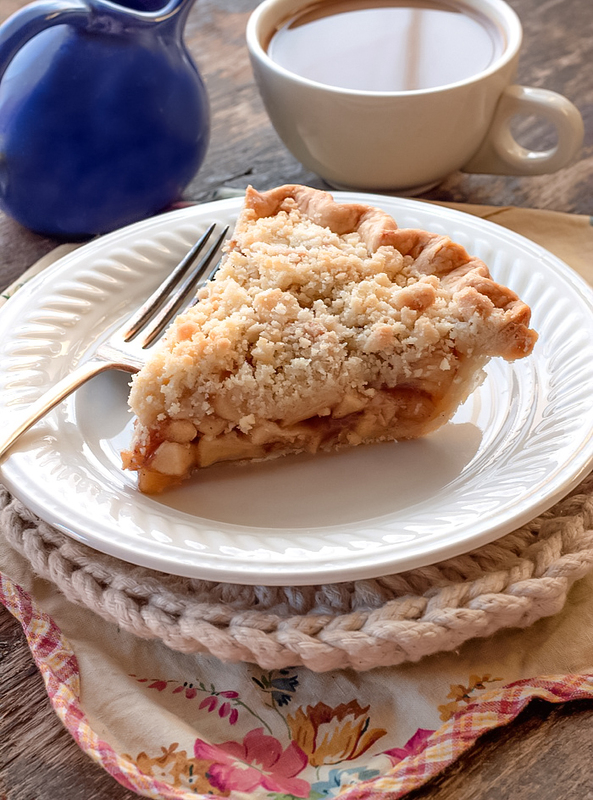 Delicious Dutch Apple Pie - the perfect combination of apples, brown and cinnamon topped with oodles of crumb topping in an all butter crust. Looking for more blueberry recipes, try these from other bloggers. Thanks for telling us what type of apples you used, most do not and we are scratching our heads when picking out the right apples… sounds yummy…. Just made this yesterday and all I can say is O.M.G!! This is the most incredible (and quite EASY) apple pie I’ve ever had! I did use a frozen crust but let it sit out for about 15 minutes before filling it. I also had some extra topping, so next time I’m thinking of using 1/2 cup of flour instead of 3/4. I used Granny Smith apples for mine. Since I used a frozen crust in the flimsy metal pan, I placed the pan on top of a cookie sheet for stability. Also, around 40 minutes, my apples were still a bit hard but the crust was dark enough, so I placed foil over top and cooked it for another 15 minutes. PERFECT!!! Can’t WAIT to make this again. Oh – I’m also planning on making this for Thanksgiving at my in-laws! Lynn thank you so much for coming back and telling me you made it! I love that! There won’t be any left over on Thanksgiving, better get a big slice!! LOL!! In the oven as we speak! Smells awesome….can’t wait to try it with vanilla ice cream.YUM!!! Anonymous, I hope you come back and tell me you loved it! I’m drooling here thinking about vanilla ice cream and Dutch Apple Pie! Anonymous, here’s a link that says YOU CAN freeze an apple crumb pie before you bake it. Check it out ! Anonymous, It’s a wonderful pie! Let me know how it goes for you! I will never, EVER buy store bought Dutch apple pie again. I’ve made this two times in as many days. (And once about a month ago.) It was demolished at my Super Bowl party. I use my go-to pie crust and top it with homemade caramel sauce. It’s like angels singing in my mouth. Thank you for sharing this recipe! Susan I’m so happy you made this and loved it as much as I do!! Thank you for coming back to tell me! Amelia Please come back and tell me of your experience, I would love to know how you’re first ever pie went!! Good luck!! I just found this and it looks so good. I’m making it on friday for a birthday dessert for the boyfriend who adooores apple pie. no cakes just pie. Excited to see how it turns out. Cant wait to make this friday. My boyfriend doesn’t like cake but loves apple pie. This will replace his birthday cake. Hi Bunny! I just want you to know that this recipe is delicious! I tried it and wrote about my experience on my blog, In My Momma’s Kitchen. I linked to this post so my fans could view the entire recipe here. 🙂 Thanks SO much for sharing such a delicious dessert! I’m making this recipe for a friend’s birthday this weekend… It is in the oven now and smells amazing! Thanks for sharing the recipe! Joan, maybe it was because the site was in the process of being moved from blogger to WordPress. I’m sorry for any inconvenience. There shouldn’t be any window that opens up and asks you to download anything! i scrolled up after my reply and can see the recipe from this page so i made it and it is in the oven as we speak. I just hope it turns out because i did not use the same apples. I’m not sure what kind they were because i got them at a park by my house. Joan, let me know how it turns out for you! No it’s 8:31pm here, just another thing that needs adjusted on the new blog! LOL!! Joan you are such a sweetheart! Thank you for coming back! You’ve made my day!! I am making this today for a late family Thanksgiving dinner. If I make it in the morning, will it heat up okay later for dessert? Thanks! Hi Kate, yes it should do just fine! Can I use Macoun apples? Kathy I’ve never heard of that apple, if it’s a baking apple it’ll do fine. Hi can I know your recipe calls for 5 1/2 cups of apples but can you please tell about how many apples will I be needing thank you, this will be my first time making apple pie. I absolutely love this recipe!!!!!! So far. I have only baked it in a glass deep dish pan. Is there a change in baking time if I used an aluminum pan? Thanks!!!!! No Michelle, no change in baking time at all. This pie recipe has been a staple in our house for the last several years now. It has become legend at church holiday events 😉 Thank you so much for sharing it. This makes the best pie EVER! I generally use use Honeycrisp apples, as those are what I usually have on hand, and find using a 1/4 cup of flour works well for the filling. Wonderful Susan, thank you so much for taking the time to come back and comment, I appreciate it! My oldest son’s favorite pie is a crumb-topped apple pie! Your recipe looks delicious! This pie looks so good! Nothing like apple pie this time of year. This is a must make fall dessert! It has all the best fall flavors!